Fiat G.50 MM 3586 of Reparto Sperimentale G.50, (XXIII Gruppo Caccia), Aviazione Legionaria, Escalona, May 1939. Standard camouflage scheme with Green and Brown blotches on Sand base, and Light Grey lower surfaces. This plane could be recognised by two large white dots painted inside the black fuselage disc. Even in this case it could have been a badge of rank (probably referred to a Tenente, maybe Del Prete) added for esthetical and propaganda reasons during the final parades attended by this unit after the war ended. Air parades were held on 15 April at Seville, on 9 May at Barajas, on 13 at Getafe, with a final fly-past over Madrid on 19 May. 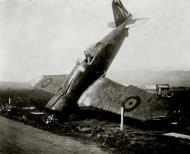 Not a single aircraft sent to Spain carried the landing gear doors, even if all of them maintained the faired tail wheel. Fiat G.50 MM 3580, of Reparto Sperimentale G.50. (XXIII Gruppo Caccia), Aviazione Legionaria, Escalona, April 1939. Three-tone camouflage scheme with Green and Brown blotches on Sand background. Lower surfaces Light Grey. After calling at Valenzuela, this unit reached Escalona on 14 March, being attached to the XXIII Gruppo Caccia, still mounted on Fiat CR.32s and led by Maggiore Aldo Remondino. Before war operations could be suspended on 1 April just a few mission could be carried from this base, where the famous “Ace of Clubs” group badge was added. Originally, the group badge, carried on a blue shield on the fuselage side, was of limited size, having to be later enlarged, probably for propaganda reasons. Even the Nationalist fuselage black disc was painted larger here than originally painted. The same type-number 1 previously assigned to Nieuport 52s, was painted red on G.50’s fuselage sides, beside black individual codes. Fiat G.50 MM 3575, flown by Tenente Enzo Martizza, Reparto Sperimentale G.50, Aviazione Legionaria, Reus, March 1939. Camouflage scheme was a three-tone with Green (Verde Mimetico 1) and Brown (Marrone Mimetico 1) blotches on Sand (Giallo Mimetico 1) background. Lower surfaces were Light Grey (Grigio Mimetico). This experimental unit had been formed at Guidonia in January 1939, to evaluate the new monoplane fighter. It received twelve aircraft from the first production batch, with the enclosed cockpit type. In February they were sent to Spain by sea-freight, just in time to be used in the final stages of the civil war. They were later reassembled at Reus airfield, arriving there on 27 February with the original camouflage, just completed by Nationalist insignia, including a plain black disc on fuselage sides, a large white cross above the wings and two narrow chord-wise black bands below, inboard of the white wing tips. A black St. Andrew’s Cross on white rudders completed the markings. Fiat G.50 MM 3582 of Grupo de Caza 27, Aviacion Nacional, Sevillla-Tablada, June 1939. Standard camouflage scheme of Green and Brown blotches on a Sand base, with Light Grey lower surfaces. Before returning home the Italian pilots consigned their eleven surviving aircraft to the Nationalist Air Force. A twelfth plane was later sent from Italy completing the order, replacing Martizza’s aircaft that was destroyed during the war. All of them retained the original Italian camouflage with the only addition of a Spanish unit’s badge on fin, representing a hound dog. Even the joke an arrows symbol of the Falange movement was painted white inside the national black disc. Italian codes remained unchanged even if, on this particular plane, the paintwork was showing traces of retoucing where the Italian unit badge had been previously carried. Fiat G.50 MM 3582 of Grupo de Caza 27. Ejercito del Aire. Nador. February 1943. The camouflage scheme consisted in Green and Brown blotches on a Sand base, with Light Grey undersurfaces. All of the twelve aircaft purchased from Italy were assigned to No.27 Fighter Group. 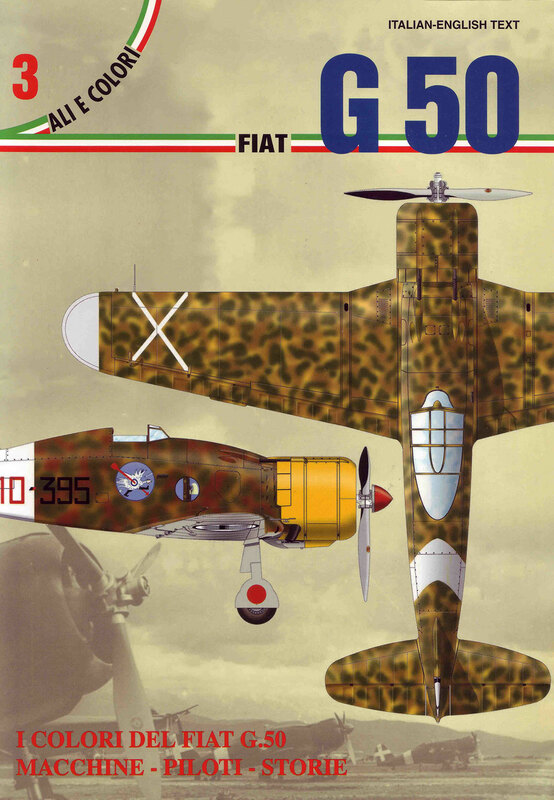 The original Italian camouflage was never changed during the type's career, even if type and individual codes were later moved across the national black disc. The Falangist insignia inside the disc was later painted red. as it was usually carried in this colour by many other Spanish aircraft. In 1940 all wing nationalist insignia were replaced by new red-yellow-red roundels, being the colours of the House of Bourbon, adopted after the war for the national flag in stead of the republican tricolour. Early in June 1939 all G.50s of Grupo 27 had been posted to Nador, near Mellilla in the Spanish Morocco. On that airfield a few aircraft were still operational in 1943, when their use was limited to training duties.